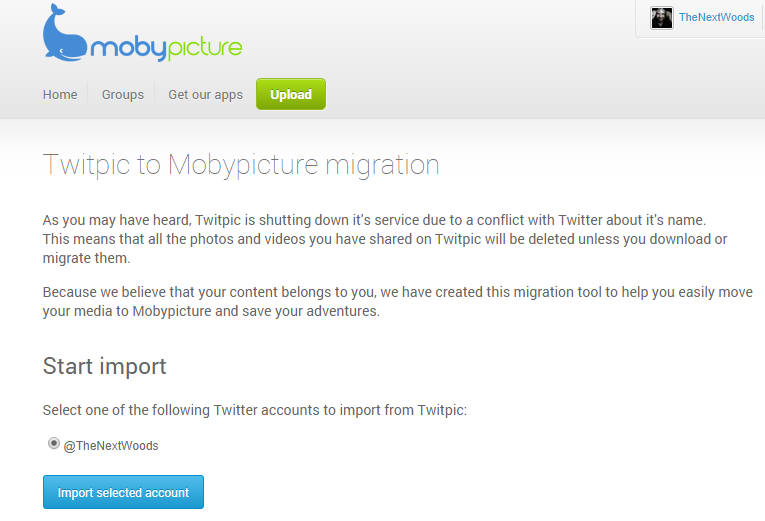 With the news earlier this month that TwitPic will be closing down its social network-tied image hosting service on September 25, many users are wondering how to keep hold of the masses of images they’ve uploaded over the years. While Twitpic has indeed provided a simple export option for users directly from the platform, it only provides a ZIP file of images and a text file with the image names and descriptions. Now, however, there’s a simple tool from Mobypicture that lets you download all your images and videos in a way that keeps them usable and searchable. To carry out the process, simply authorize Moby to access your Twitter account via the import page tool – if you don’t have a free Moby account, you’ll be prompted to set one up after doing this – and then hit the ‘Start Import’ button. Then, depending on how many images and videos you have, you’ll need to wait. He adds that once you’re done importing your pictures, you can just carry on where you left off as Mobypicture allows for direct sharing of images, videos and sound clips to a number of different social services, like Facebook, YouTube, Blogger, WordPress and more, rather than just Twitter. If, however, you’d still like to do it the old-school way and just receive a downloaded ZIP file with your data, you can access that via your Twitpic account settings – it’s limited to the last 5,000 images though, just in case you’re a prolific collector. There are also other projects on Github, if you prefer. Disclosure: Mobypicture CEO Mathys van Abbe is the partner of a member of The Next Web’s events team.